People in Juneau, Alaska, about 750 miles from the volcano, heard the sound of the blast – over one hour after it occurred. The morning of June 6th arrived on the Alaska peninsula to find the area which is now Katmai National Monument being shaken by numerous strong, shallow earthquakes. The most powerful volcanic eruption of the 20th Century was about to begin – but very few people knew about it. The Alaska peninsula has a low population density today, but in 1912 it was even lower. Beyond the land shaken by the earthquake activity, the beginnings of this event were almost unnoticed. Today the stirring of an important volcano draws enormous global attention. Weeks or even months before most large eruptions, a buzz circulates through an electronically-connected community of volcano scientists as clusters of small earthquakes are detected by a global array of seismographs. Many scientists working at diverse global locations interpret this data and begin to collaborate about an awakening volcano and the eruption that might follow. Reports are posted on the internet and news stories communicate the volcano’s activity to millions of people. Often it is a false alarm – the volcano is simply stirring. On June 6th, 1912 a tremendous blast sent a large cloud of ash skyward and the eruption of the century was underway. People in Juneau, Alaska, about 750 miles from the volcano, heard the sound of the blast – over one hour after it occurred. 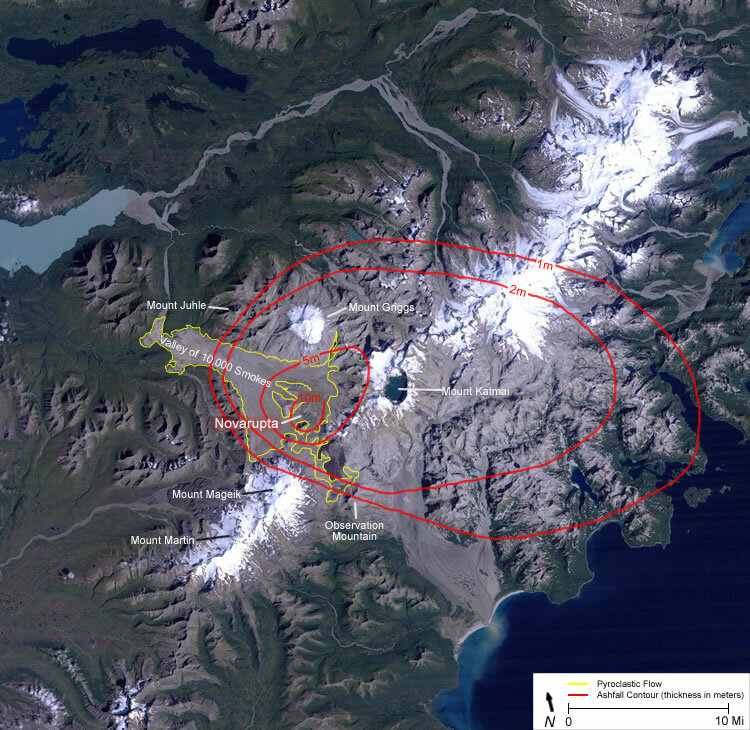 Forty years after the eruption, investigators finally realized that Novarupta – and not Katmai – was the source of the tremendous blast. Within just a few hours after the eruption a thick blanket of ash began falling upon the town – and ash continued falling for the next three days, covering the town up to one foot deep. The residents of Kodiak were forced to take shelter indoors. Many buildings collapsed from the weight of heavy ash on their roofs. Outside, the ash made breathing difficult, stuck to moist eyes and completely blocked the light of the sun at midday. Any animal or person who was caught outside probably died from suffocation, blindness or an inability to find food and water. First, the valley of Knife Creek was now barren, level and filled with a loose, sandy ash which was still hot at depth. Thousands of jets of steam were roaring from the ground. Griggs was so impressed that he called it the “Valley of 10,000 Smokes”. During the eruption a large amount of magma was drained from magma chambers below. 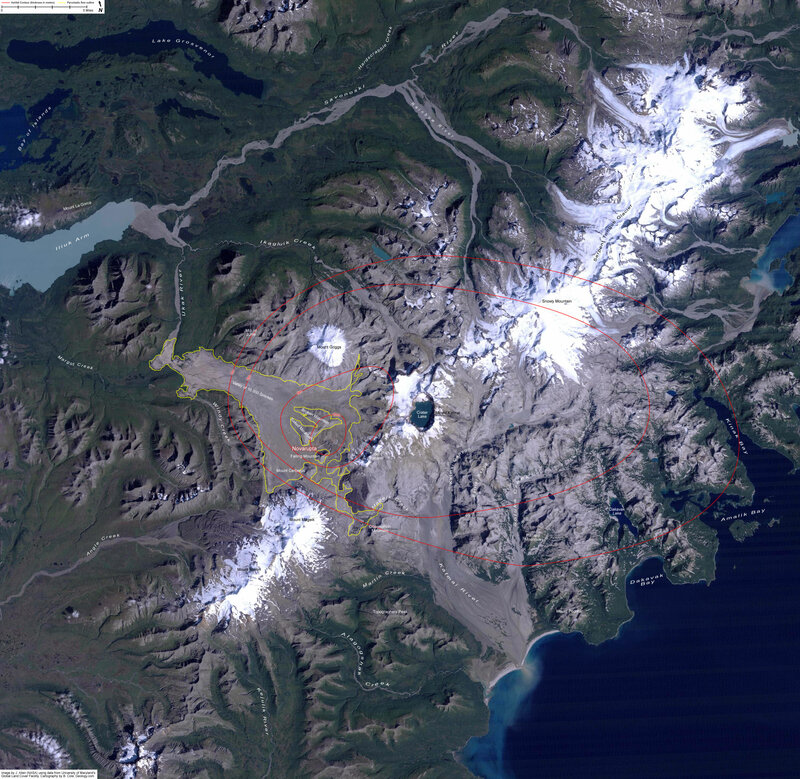 The result was a removal of support from beneath Mount Katmai which is six miles from Novarupta. The top several hundred feet of Katmai – about one cubic mile of material – collapsed into a magma chamber below. This collapse produced a crater about two miles in diameter and over 800 feet deep. It was not until the 1950s – over forty years after the eruption – that investigators finally realized that ash and pyroclastic flow thicknesses were greatest in the Novarupta area. This discovery produced a revelation that Novarupta – and not Katmai – was the volcano responsible for the eruption (see satellite image medium resolution, 164 KB or higher resolution, 1330 KB). This is possibly the most important false accusation in the history of volcanic study. Large eruptions of Novarupta’s scale at high latitudes can have a significant impact upon global climate. Recent studies have linked high latitude volcanic eruptions with altered surface temperature patterns and low rainfall levels in many parts of the world. The 1912 eruption of Novarupta and other Alaskan volcano eruptions have been linked with drought and temperature changes in northern Africa. Another significant impact is the distribution of volcanic ash. The image at right shows the ash fall impact areas for five important volcanic eruptions of the 20th century. Augustine (1976), St. Helens (1980), Redoubt (1990) and Spurr (1992) all produced ash falls of significant regional impact. However, Novarupta’s ash fall was far greater than any other Alaska eruption in recorded history and contained a greater volume than all of the Alaska eruptions which have been recorded combined. One of the most important reasons to monitor volcanic eruptions is the potential danger that they present to commercial air traffic. Jet engines process enormous amounts of air and flying through finely dispersed ash can cause engine failure. Impacting the tiny ash particles at high speed is very similar to sandblasting. This can “frost” the jet’s windshield and damage external parts of the plane. Before the danger of flying through finely dispersed ash was appreciated several commercial jets were forced to land after sustaining serious damage while in the air. Eruptions the size of Spurr, Augustine, Redoubt and St. Helens can damage jets flying over 1000 miles away. An eruption the size of Novarupta would ground commercial jet traffic across the North American continent.